see? i identify with this. I don't know why, but when I read a classic book I usually seem to get hold of it by the wrong end. I don't go to misinterpret or to catch a different meaning than everyone else, but somehow I do. When I read, I let the story carry me. I let go of analysis until I have finished the book. Its effect on me usually remains to be seen until the final pages are gone. I don't know how to analyze as I go. And even if I did, I think I would get caught in the current of the story and forget to. When I was younger I used to grow frustrated that I couldn't foresee the solution of a mystery when my brother, bless his soul, could guess in three pages who had done it and how, and possibly in which room. Then I grew older, and it frustrated me (and still frustrates me) that I seem to interpret books differently than the official analysis. Take, Go Set a Watchman by Harper Lee. That book made critics throw back their heads and howl with pain as Lee allegedly ripped the character of Atticus as we know him, to shreds. When I read the book I was disappointed in Atticus, yet Lee had built her characters and story-world well enough that the shift in conviction didn't exactly ruin Atticus for me. It made him even more real...because he has a (very large) flaw that one didn't see in To Kill a Mockingbird but that one could believe given his age and times. There is an argument to be made for the idea that Harper Lee didn't intend the version of Atticus seen in Go Set a Watchman to be the Atticus the world knew because, after all, she published TKAM and Atticus mightn't yet have been in his final form in its prequel. There is that argument (I spent some time this weekend arguing the point with the aforementioned brother) and that is a topic for another post. But the fact remains that I didn't react the way the majority of the public reacted to Go Set A Watchman. Likewise, upon strength of recommendation from a friend, I dived into J.D. Salinger's work this week. He is best known, I believe, for The Catcher in The Rye. I've read that and am now halfway through Franny & Zooey. Since I entered Catcher not knowing anything about it, really, except that it was generally regarded as something People Should Read, I had no preconceived notions about what it would or would not be. My initial reaction was that Salinger is a darn good wordsmith. The best way I can describe the way his writing effects me is that it feels like soda bubbles up one's nose. It's unexpected and fresh and totally different than most anything else I've ever read. My second reaction was that I, too, could write like Salinger if I replaced all my adjectives with swearing. My third reaction was that Catcher's main character, Holden Caulfield, was a boy who'd grown up too fast. His morals are questionable at every turn, but his heart is gold. I know that sounds like an anomaly. Perhaps it is. But what I saw in the character was a boy who has rushed headlong into the world and its many pleasures and yet finds himself confused by the hollow chaos and unsure how to handle how he feels about it. He is kind-hearted. He is smart. He is empty. He is generous. He has known tragedy and he has known happiness, in some small way. The kid's winded, that's for sure. 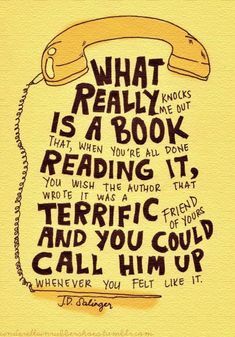 He's going to kill himself presently if he doesn't get a grip, but I had a soft spot for Holden Caulfield. H.C.: "What're you *%#% introducing yourself to me for?" Me: "Oh, I thought you looked lonely. It's a little cold out here. Want to step inside?" H.C. looks at me and shrugs. We step inside, camera shifts, H.C. shudders some rain off his coat. Me: "That's a dashing hat. Very red." H.C.: "Why the &$#@$@ does everyone comment on my hat? Isn't a fella allowed to wear a $%#$3 hat every once in a while if he wants to?" Me: "Well, it's a very nice hat." I'd come away thinking that H.C. was a bit of a crab, had a great many peculiarities, but was probably a fairly nice person on the whole. I wouldn't sit there and psychoanalyze him and start getting a pathological fear of people who wear red deerstalker hats and try not to go home so they won't get into trouble with their parents for flunking out of yet another school. I mean, don't get me wrong: Holden Caulfield has problems. But I think I'm the one about to develop a paranoia of letting madmen go undetected. The really disturbing part is when, like with the quote above, I identify with the supposedly nut-so character in question. I hate the fact that I don't pick up on subtle cues in literature. I'm not a great one for symbolism. I like people to say what they mean but I don't mind if it has two or three meanings. I like complexity. But I'm also not going to assume that when you put a character in a red hat he bought in New York City, that he needs a psychiatrist. I mean, give a man a sartorial break. At any rate, this is why I don't do book reviews on my blog; I always seem to come away with quite a different impression than the author intended and I'm not sure what that says about me. So now I want to open up a discussion and ask you: are you one of the dedicated G.P. that foresee the psychological conclusion of a character like Holden Caulfield or are you more like me: a woman a bit shy to clap the shackles of a sanitarium on a person who hasn't proved himself in any concrete way to be a total loony? I HATE conventional, "correct," interpretations of literature. I took English classes and loathed the discussions. We were given essay tests, and I got a 100% on one because I MEMORIZED everything the prof said because of a lower grade on a previous test. That test was not for original thinking. I do not like reading "official" book review, they ruin stories for me. Yeah, so maybe I miss some and yes some books are written loaded with symbolism (that is not an art but a mindgame/trick to me, and I do not have much use for such work). But peoples, they are TOTALLY lying about some of the stuff they say. I really think people like to feel overly intellectual, erudite, etc. Sorry, but no one is going to remember YOUR books, or your classes, or your "critical interpretations" . . . which is really what I think the aim is most of the time. And usually the interpretations are really bald, banal, ugly, demoralizing, degrading. Some books really are that way, but I have heard too much good soiled via "critical interpretation" or intellectual analysis or whatever term they want to call their dissection. I can understand now why many public schoolers hate reading (and in a similar vein, after experiencing conventional history, why they hate/ignore history). I am sorry for the tome. And thank-you for this post. Rachel, you should do more book reviews on your blog, not fewer, because your take on literature is refreshing and a little more akin to mine. I have never been good at analyzing books as I go and I have always been more inclined to empathize with and understand characters rather than psychoanalyze them. I have yet to read "Go Set a Watchman" by Harper Lee but I love "To Kill a Mockingbird" so I guess I should be afraid of reading "Go Set a Watchman"? except flawed characters or even slightly mental characters don't scare me...if anything, they intrigue me and make me love them even more in spite of their flaws or maybe because of their flaws. Oh, yes, do more book reviews. I love blogger book reviews; after reading another comment I thought I should clarify. The book reviews that are "critical" interpretation types, like something in a newspaper or journal or that smack of English profs, are what I dislike. I find so many books to try via blogs. I think everyone interprets things differently. I think I'm a lot like you, I choose to see the best in people.